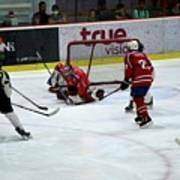 Bangkok, Thailand - March 21, 2017: Mongolian ice hockey players defend goal as the Malaysian team attacks. 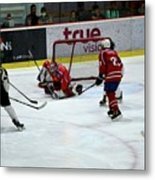 The goalie is seen trying to stop the puck. 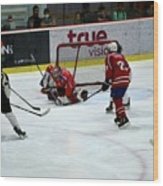 The game was part of the 2017 Ice Hockey Challenge Cup of Asia tournament which took place in the ice skating rink of the Central Plaza Grand Rama IX shopping mall in Bangkok, Thailand.